The Bussey Family: More $@&#(!^ Snow! 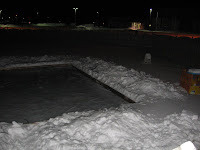 In Icing the Rink I mentioned how I had spent Friday night shoveling out the rink. That gave me 36 hours to try and get an ice base on it. Since I didn't have a water tight seal, the plastic sheet was flat on the ground, I ha to work the sprinkler. Moving it around to fill an area then move the sprinkler to let it freeze. There was some good weather for it. Nice minus teens. -15 through -18 Celsius. It's a little hard to see on the small left shot but there is a little round yellow metal sprinkler working hard out there. It's metal with no moving parts so it won't freeze. I've used vapour barrier for the bottom previously. About $20 for a 20'x100' sheet that I would cut in two to make my 40'x50' base sheet. That would go over the wooden frame. The problem that ended up happening was that the sheet would tear. So it wasn't water proof anyways. I.e. so it would collect the water if I flooded it. The end result is that I have to go slowly to build up the layers. 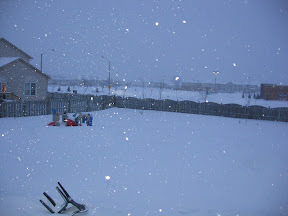 That's when I ran into this, our snow storm. For those astute readers you may have noticed that the chair and play structure are the same from the ice rink picture above. In fact it was taken from the same vantage point just 48 hours later. 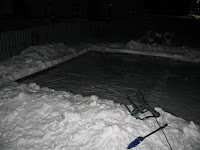 Yes my rink is under another foot of snow. So now I'm trying to figure out how I will get my neighbours snowblower into the back yard. I think he thinks I'm joking. Posted by PB at 1:58 p.m.
Is this what they had hoped for? A Week with No Posts?